I know that it’s summer, and typically roasted sweet potatoes are not a summer dish. However, we had some pretty ferocious thunderstorms in Northeast Ohio this afternoon, and I wanted food that was warm and comforting – roasted veggies definitely fit the bill! 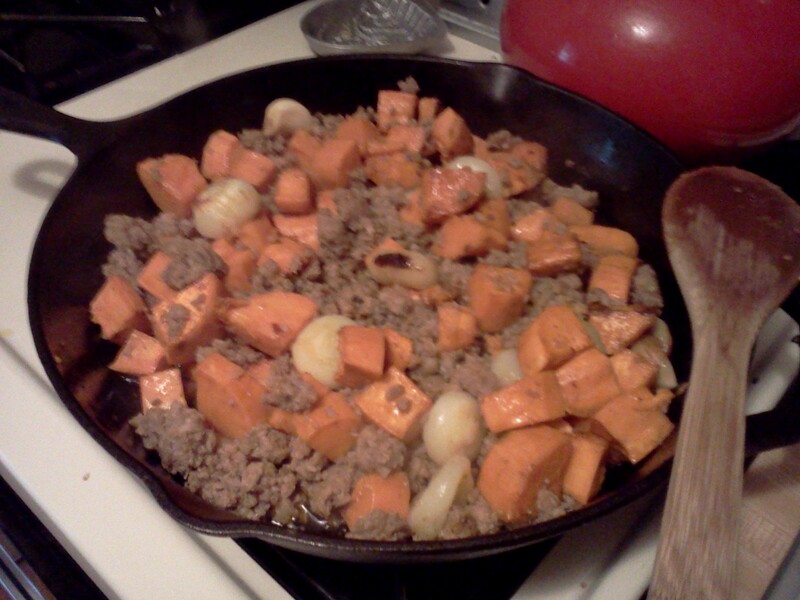 I knew I had some chorizo in the fridge, so on the way home from work I picked up some cipollini onions and sweet potatoes. Plus, I wanted to try my sunny-side up egg technique again! The avocado got thrown in because it needed to be used before it got overripe – I hate to waste them! I sliced it, added some lime and a little salt, and it was actually a nice touch. Now that I look at the picture, all of this stuff would probably be good as filling in a breakfast burrito! Hmmmm….I do have leftovers, so maybe I’ll try it tomorrow. Only one problem: Now that I’ve eaten, I think I need a nap! Preheat the oven to 400 degrees. 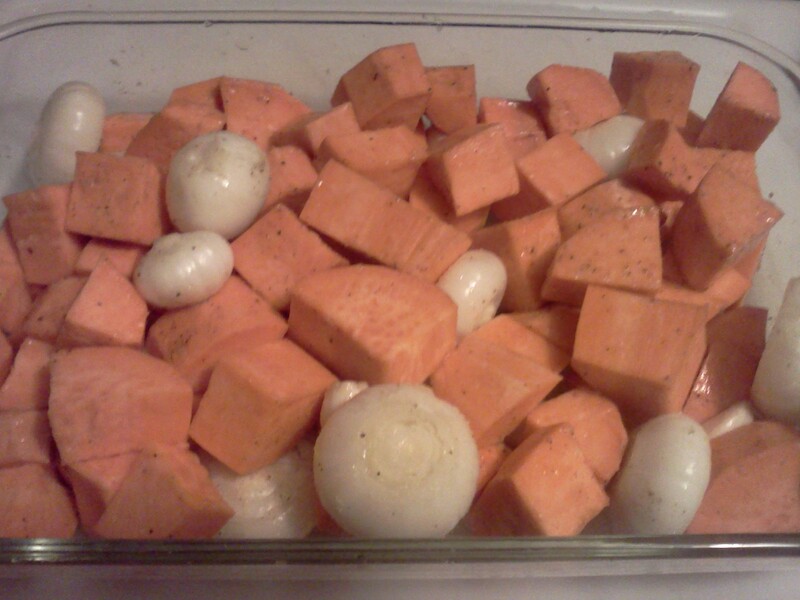 Toss the sweet potatoes, onions and garlic with olive oil, salt and pepper. Pour mixture into a casserole dish and bake for about 1 hour. 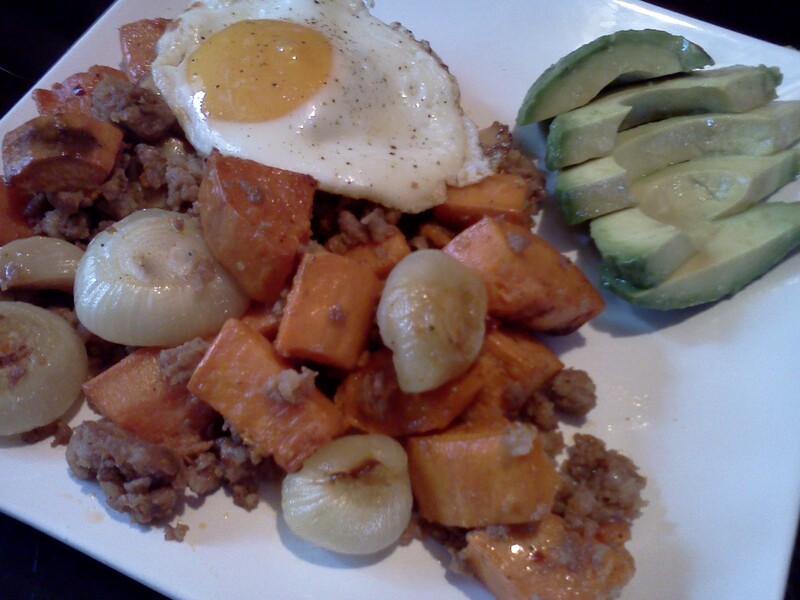 When the eggs are done, place an egg on top of the chorizo and sweet potato mixture. Serve with half an avocado and dig in! 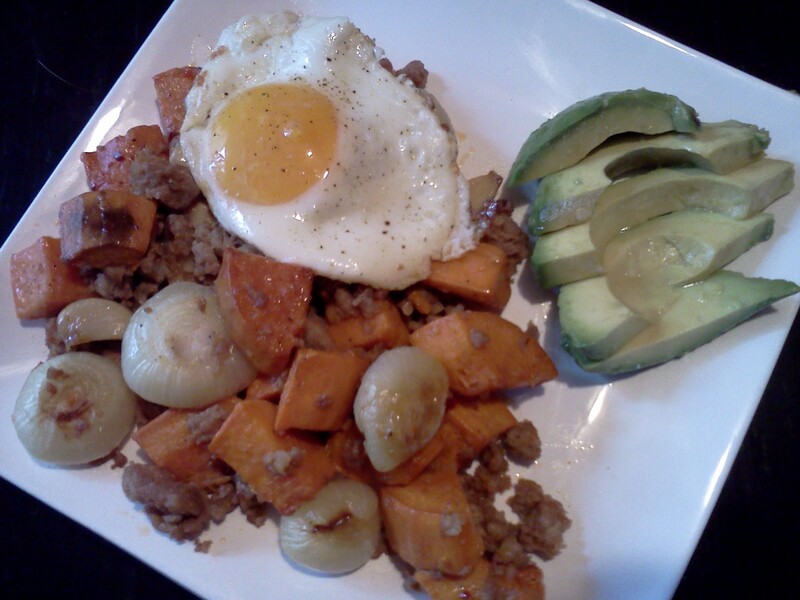 This entry was posted in Dinner, General, Recipe and tagged avocado, chorizo, eggs, garlic, onion, Roasted Potatoes, roasted veggies, sweet potato on June 25, 2013 by Melissa. Looks terrific–My daughter found a sweet potato when she was repotting a sweet potato vine (that spent the winter on top of my microwave) into an outdoor pot, so I’ve even got a sweet potato handy, and with our storms, I’d enjoy comfort food. Thanks, Kirsten! I’d love to grow sweet potatoes, but I’ve never tried it. I love sweet potatoes no matter what time of year. I had the best sweet potato tater tots at the farmers market yesterday. One of the food trucks was selling them. Yours look delicious with the huge chunks of onion. Mmm, and your egg is perfect. I think I’m getting hungry for breakfast over here. Thanks, Meghan! I can’t stop eating eggs-I just made some for breakfast today! I love the “egg on top” idea. When we get really wonderful eggs from Breakneck Acres I like to feature them as important in the dish, too! I bought those little egg poacher cups from Sur La Table a couple of years ago and they work great! They are made out of silicone. Have you ever seen those, Melissa? I’ve never poached an egg! I’m not sure I’m ready to try that yet, to be honest. 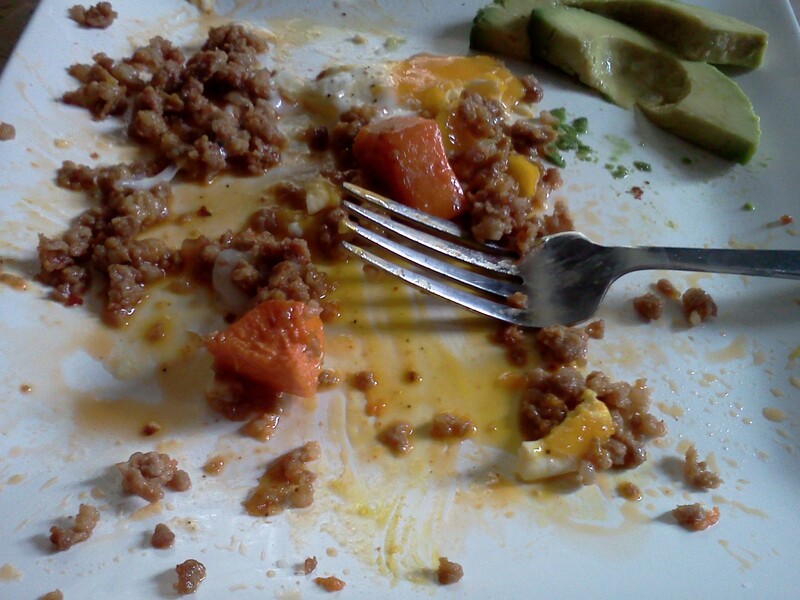 I know, it’s kind of gross because the yolk is still runny and becomes a sauce for whatever else you have underneath. Maybe you should start with Pasta Carbonera to see if you can do that! That is not so weird because the egg yolk makes a sauce with bacon and you have the pasta. It’s delicious.